A Maverick, a generic but common helicopter introduced in GTA Vice City. Helicopters are recurring aircraft first introduced in Grand Theft Auto 1 as non-controllable vehicles, and available as controllable vehicles since Grand Theft Auto: Vice City. Helicopters complement fixed-wing aircraft, and possesses advantages and drawbacks. Due to similar attributes, gyrocopters such as the Little Willie are classified under this article, although both the helicopter and the gyrocopter fall more accurately under the rotorcraft category. Helicopters are vertical take-off aircraft which utilize one or more horizontal rotors to control height and one tail rotor to stabilize the aircraft from spinning out of control from the force of the horizontal rotor(s). As a result of its construction, helicopters are more capable of executing vertical takeoff and landing, as well as hovering in the air, but is slower in speed than fixed-wing aircraft as horizontal movement is dependent on the tilt of the vehicle rather than the propulsion of the rotor. The player can control the speed of the rotor using the acceleration and brake command, while banking, which requires the use of both the steering commands for side banks and two sets of directional commands for forward/backward leans and turning. Since GTA Vice City, helicopters in GTA typically support between one to four occupants. With its rotors fully exposed, the blades of the helicopter itself can be effectively used as a weapon against any person on the street, killing them instantly on contact, but requires risky controlling of the aircraft. Games prior allow only the horizontal rotor to inflict such damage, while helicopters in GTA IV allow the player to kill using the tail rotor as well. Helicopter kills do not attract police attention in the 3D Universe and GTA IV. In GTA V, helicopters are now significantly harder to fly - they sway constantly even in good weather. This relaxed stability does not extend to pitch control, as the game will automatically correct and limit the downward pitch of a helicopter - it is no longer possible to fly a helicopter upside down. Helicopters can sustain damage and crash or explode as a result. The earliest known helicopter to possess this weakness are the Police Helicopter and Helicopter in Grand Theft Auto III, which are vulnerable to gunfire or a rocket launcher. By the time helicopters were controllable in GTA Vice City, helicopters may also suffer damage from impact on hard surfaces (with the exception of landing) or other solid objects, and seize to function outright in water if they do not have pontoons (i.e. the Sea Sparrow). The degree of damage on a helicopter is only indicated by the presence of smoke or fire appearing from the horizontal rotor. The system remains unchanged until Grand Theft Auto IV. In GTA IV, the damage mechanics of helicopters has been improved greatly. If the helicopter blades hit a wall too much, the blades will be ripped apart and the helicopter, devoid of its ability to maintain lift, will fall, inflicting damage and even killing the player. Also, the entire tail boom can snap off if the player strikes it against a building or barrier with enough force. With the tail boom destroyed, the player has little control over the rotation of helicopter. The tail rotor is used for stabilizing the helicopter by providing a force against the rotational force of the main rotor as well as rotating the helicopter through the use of the rudder pedals so the lack of one causes the helicopter to spin in circles rapidly. While in a helicopter, beeping can be heard once the helicopter sustains too much damage. If the helicopter sustains more damage after the beeping alert is heard, it can either explode (which will be evidenced by the engines being on fire) or the tail boom will break off. Also, though hard to make happen, instead of the entire tailboom being severed, the tail rotor may shatter, resulting in the same realistic spin effect. Less commonly, enough damage can be inflicted on the helicopter to cut the engine. This can cause the helicopter to fall out of the sky, similar to losing its main blades. Much like fixed-wing aircraft, the weather has a noticeable affect on helicopters in Grand Theft Auto: San Andreas and Grand Theft Auto: Vice City Stories. In windy or rainy conditions helicopters will bank and sway in the direction of the wind, which makes flying at low altitudes dangerous. Players can avoid accidents by flying at higher altitudes, where there is plenty of room to manoeuvre. Helicopters can be used as a weapon. Since GTA III, police helicopters will shoot from their helicopters at the player if the player receives a wanted level of three or more, with the exception of GTA IV where actual police officers will shoot from the helicopters instead. Mounted weapons may be available on certain models, including the Sea Sparrow, Hunter, Annihilator and Buzzard. From GTA III to GTA Vice City Stories, mounted guns can auto-aim at targets to a certain extent while rockets need to be aimed by the player. Since GTA IV, mounted guns can no longer auto-aim and has to be manually aimed. The main blades of the helicopter can be used to instantly kill any people. Until GTA IV, players cannot kill themselves using the blades their own helicopters or police helicopters. Kills using the blades of the helicopter does not warrant the player attention from the police. GTA IV introduced additional damage with the blades by being able to collide with vehicles and throwing them around. In Grand Theft Auto: San Andreas, if the player's helicopter is tracked by a heat-seeking missile, the helicopter will signal the player with a rapidly beeping sound and the location of the missile in the radar. This applies to planes as well. The Grand Theft Auto III Police Helicopter was meant to appear in Grand Theft Auto: Vice City, but cut during development. This is evidenced by the handling files, and it is probably replaced by the Police Maverick, probably a leftover from GTA III. 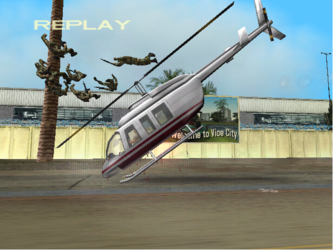 In the original PS2 version of GTA Vice City, entering a spray shop with a helicopter will result in the helicopter acquiring wheels. This page was last modified on 20 February 2015, at 19:49.